What Are Low-Dose Lung Cancer Screenings? In the past, the most common way to detect lung cancer in a patient was to administer a traditional chest CT scan, which would identify cancers the size of a dime or larger and take up to 15 minutes. Now, doctors have a faster, more precise way of finding cancer using less radiation via what’s called a Low-Dose Lung Cancer Screening. What is a Low-Dose Computed Tomography Scan (LDCT)? A Low-Dose CT Scan differs from a traditional chest X-ray and is also sometimes referred to as a helical CT scan or a low-dose spiral. It is a newer form of scanning that rotates continuously to take 3D X-rays of the lungs, moving in a spiral motion as it captures the imagery. The reason it’s called a “low-dose” CT scan is because it utilizes significantly less ionizing radiation than the regular chest CT scan that has been in use for decades. How is a LDCT Scan superior to other types of screenings? Aside from the reduced amount of radiation used in the test, it’s a much faster procedure, taking less than five minutes vs. the 15 minutes that a regular chest CT scan would take. Furthermore, because the test produces so many cross-sectional images from inside the body, and utilizes additional computer diagnosis, it provides a vaster look into possible cancers. For example, an LDCT scan can identify cancer the size of a rice grain, whereas a traditional X-ray could only detect larger formations. This means that cancer can be caught when it’s smaller, earlier in its growth, giving it less of a chance to spread if treatment begins sooner. In addition, the painless, non-invasive low-dose CT scans use no dyes and don’t require the patient to swallow or be injected with anything. How is it used for lung cancer screenings? The CT scanner rotates around the patient using multiple x-ray beams and a set of electronic x-ray detectors. Simultaneously, the examination table moves through the scanner, so that the x-ray beam follows a spiral path. Computer software processes this data to formulate cross-sectional images of the body, which are then shown on a monitor for the experts to capture and study. To perform the exam, the technologist will position the patient on the table, most likely wearing only a hospital gown, typically lying down completely still. The patient will be signaled to raise their arms over their head as the table advances through the machine and hold their breath for a few seconds as the actual as the actual CT scan happens. It’s a very fast procedure and more time is actually spent preparing for it than doing it. 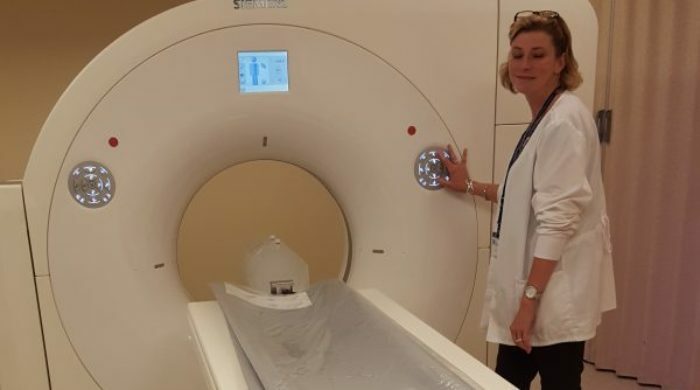 Those who suffer from claustrophobia may also be relieved to know that both ends of the scanning machine are open for the duration of the procedure and the technologist performing the exam can see and hear the patient at all times. Who should be screened with an LDCT scan? The first step you should take if you know you are at risk of getting lung cancer is to speak with a doctor about getting tested. The Western Washington Medical Group Imaging Center is staffed with skilled technologists who have your best interest at heart. Schedule an appointment there today to get the answers you need.